Welcome to the latest (emphasis on late!) installment in our annotations of the collected edition of The Trial of the Flash! A while back, we analyzed related stories leading up to the release of Showcase Presents: The Trial of the Flash. In addition, we interviewed author Cary Bates about the buildup and the Trial itself, plus showed you what wasn’t included in the collection. IN THIS ISSUE: The Final Fate of Gigi! Links to original artwork, scans and research are included throughout this post. For definitive legal analysis of the story by Bob Ingersoll, go here. Tom vs. Flash took on this issue here. See you after the jump! COVER by Carmine Infantino and Klaus Janson. In addition to this issue, Janson also inked the cover to World’s Finest Comics #306 cover-dated August 1984. This is the first issue before the Showcase Presents collection skips three issues. We’ll be tackling those in one post next time, as there are some crucial plot elements that unfold therein. PG 1 & 2: The two men seen here were contracted last issue via a mysterious tape recorded message. The male victim, seen here alive, was making a tape recording of his own outside of the Horton house last issue. He was speaking with an “assistant” on the other end of a radio. PG 3 – 6: Scenes like this one between Flash/Barry and Patty Spivot make it easy to understand why Geoff Johns and Francis Manapul/Brian Buccellato chose to reintroduce her as a major character and love interest. Plenty of groundwork for that relationship exists in these “final days” stories and prior. 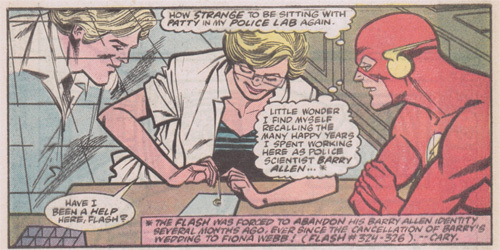 Flash appears to have the Pied Piper angle figured out just a page earlier, but almost seems to use the case as an excuse to visit Patty and the lab. It’s clear Barry also has an inkling that his first lawyer’s office exploding might be linked to his current lawyer’s avalanche problem. PG 7-9: The National Penetrator is a tabloid that has given Flash some negative publicity in the buildup to the Trial, coinciding with the Pied Piper’s assault on his public image. PG 10: The fact that Cecile is saved by her sensory-deprivation tank ties in nicely to the psychological themes and Easter eggs seen throughout Bates’ Flash writing, something we also covered in our interview with the writer. If the storyline is viewed as a purely academic wringer, knowing Flash’s fate beforehand, it is hard to ignore scenes like this where parapsychology and the paranormal always seem to have the upper hand. 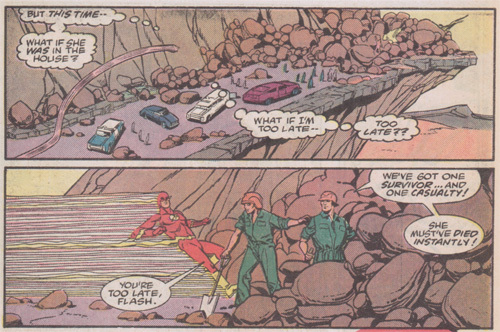 PG 12 – 13: This scene mirrors Flash’s rescue of Mayor Pinchot. The Pied Piper attacks Flash via Pinchot in the public forum, while Horton represents his defense. Both Piper and Horton hate Flash, but from different sides of the law. Pinchot’s grateful appeals reflect Horton’s equally ungrateful turn. Flash removes an artifact from Pinchot (microsonic pipe), but returns one to Horton (watch). Flash rescues Pinchot from the air, and Horton from the water (in her tank). PG 14 & 15: Barry’s father, Dr. Henry Allen, is referred to as “Herbert” in the first panel. Then, Barry corrects his mother on legal eagle “N.D. Redik’s” proper name. I am fairly certain this is a recurring in-joke (at this point in the title’s run) on the generally inconsistent naming continuity in Flash’s supporting cast (and Rogue’s Gallery). PG 18 – 20: Redik’s specific motive is first revealed on page 20. Not that it matters, as it is simply why he wanted/needed The Flash Case so badly. The original art for page 19 can be seen/purchased here, and page 20 here. PG 21 – 22: Flash seems to enjoy the opportunity to see Redik go to trial. Multiple suicide attempts by Redik over these two pages – I’d say that is dark stuff for pre-Crisis DC. There’s also some next level stuff in fourth panel, page 21, as Flash’s rote heroic witticism is interrupted by the second suicide attempt. Flash’s “two strikes and you’re out” game could be Cricket, according to Law 34 in the Laws of Cricket. The original art for page 21 is available here. PG 23: Now, Flash seems to resent Redik’s demise exclusively because he is avoiding “the humiliation of a trial” (emphasis from the lettering). The original art for this page can be viewed/purchased here. This is a packed, cathartic issue with a lot of resolutions as the pre-Trial half of the collection comes to a close. That said, a lot happens in #s 337-339 that impacts the final 10 issues of the title. We’ll cover those in detail next time! This entry was posted in Annotations and tagged Barry Allen, Carmine Infantino, Cary Bates, Crisis on Infinite Earths, frank mclaughlin, klaus janson, Patty Spivot, Pied Piper, showcase presents, the trial of the flash on May 31, 2014 by Greg Elias. Greg is a lifelong DC Comics fan and Flash collector who began contributing to Speed Force in 2010. He currently lives and works in South Carolina, with his wife Ellen.